Two years ago I bought an Asus laptop with Windows Vista pre-installed. I now want to reinstall Windows and fully format the hard drive – however, the sticker with the Windows product key under the laptop is unreadable. How can I retrieve the product key? It seems stupid that it was only placed on the sticker that is destroyed after some time if you frequently hold the laptop on your lap. If by any chance, you’ve lost your Windows Vista product key, no need to worry! Product Key Finder can recover it for you. It’s a great software that retrieves your Windows Vista product key from registry, giving you access to print or save it for future. It recovers keys for Windows 8/7/Vista/XP, Windows Server 2012/2008/2003/2000, Office 2013/2007/2003/XP, etc. It can also recover lost keys for many other applications as well. How to Recover Lost Windows Vista Product Key? Download and install Product Key Finder on your Windows Vista computer. Installation is pretty simple. Just follow the on-screen instructions to complete the setup and run the program. Click on “Start Recovery” button, it will bring up a list of recovery options: From current system, From non-booting system and From remote computer. Select the “From current system” option, the program will instantly decrypt and recover Windows Vista product key, and find license keys for other commercial software installed on your local computer. After recovering your lost Windows Vista product key, you can save it in a plain text file for easy reference at some later date. Remember to create a backup of your product keys on a regular basis in case of system crash or re-installation of Windows. I have a 3 year old OEM HP laptop with Windows Vista on it. The problem is that my Windows Product Key sticker (COA) on the back of my laptop has faded away. I can hardly read the key on it. Can you please help me by suggesting ways of retrieving it. I don’t know how many times people have asked me for a way to find Windows Vista product key because they threw away the documentation that came with their computer, thinking they didn’t need it. Another common reason for needing to recover Vista product key is that the product key sticker on the computer is worn and you can’t read it. Well, you are in luck because there is a simple, quick way to find out your lost Windows Vista product key. 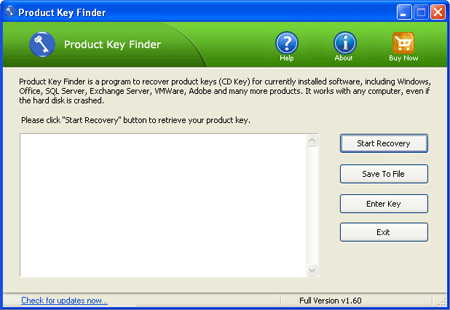 With Product Key Finder program you can recover and find Windows Vista product key from your current system. Just a few steps to get lost Vista product key back. No need to purchase a new copy of Windows Vista after misplace the product key. How to Find Windows Vista Product Key? Download and install the Product Key Finder software, then launch it. From the main screen, click on the “Start Recovery” button. It will display a list of recovery options. Choose the “From current system” option, the program will recover and find your Windows Vista product key inside the Windows registry. Copy the product key to a text file or print it for safe keeping. It’s that easy! Follow the steps above you can easily retrieve Windows Vista product key from either pre-installed OEM machine or a retail copy of Windows Vista system. Well, now I hope you were able to find your Vista product key and now you are ready for a reinstall of Vista or you can save the key for later use.